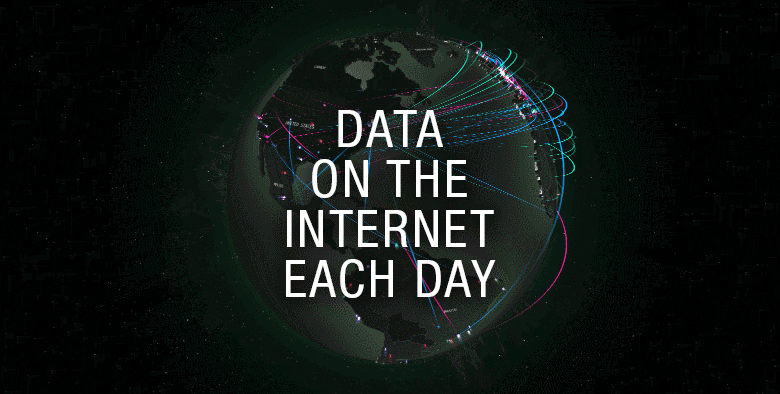 How Much Data is Created on the Internet Each Day? 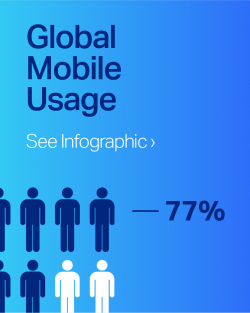 90% of the data on the internet has been created since 2016, according to an IBM Marketing Cloud study. People, businesses, and devices have all become data factories that are pumping out incredible amounts of information to the web each day. 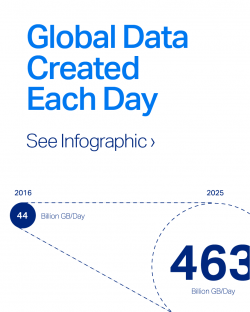 We’ve been tracking the growth of data created on the internet for several years, and have updated the information for 2017 to show you how much data that is being created on the internet – every day! In 2014, there were 2.4 billion internet users. 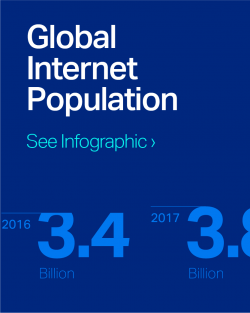 That number grew to 3.4 billion by 2016, and in 2017 300 million internet users were added – making a total of 3.8 billion internet users in 2017 (as of April, 2017) This is a 42% increase in people using the internet in just three years! Not only are there more people using the internet, but they are using it in many different ways. Social Media is HUGE – Reports show that social media gains 840 new users each minute. Since 2013, the number of Tweets each minute has increased 58% to more than 455,000 Tweets PER MINUTE in 2017! Youtube usage more than tripled from 2014-2016 with users uploading 400 hours of new video each minute of every day! 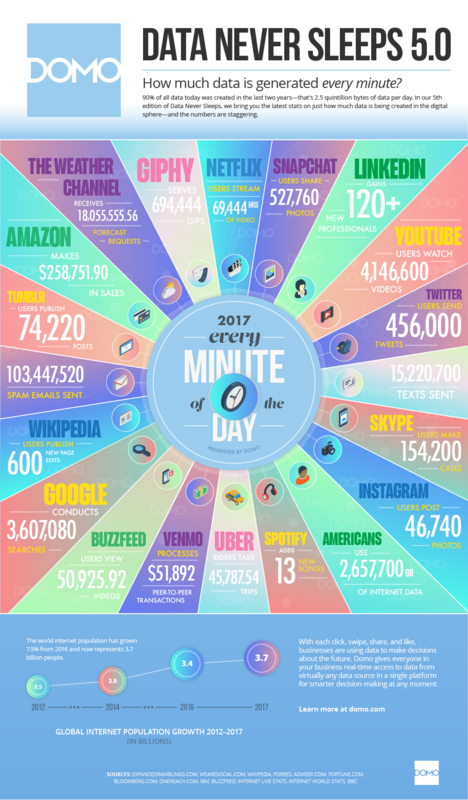 Now, in 2017, users are watching 4,146,600 videos every minute. Instagram users upload 46,740 million posts every minute! Since 2013, the number of Facebook Posts shared each minute has increased 22%, from 2.5 Million to 3 million posts per minute in 2016. This number has increased more than 300 percent, from around 650,000 posts per minute in 2011! Facebook users also click the like button on more than 4 million posts every minute! 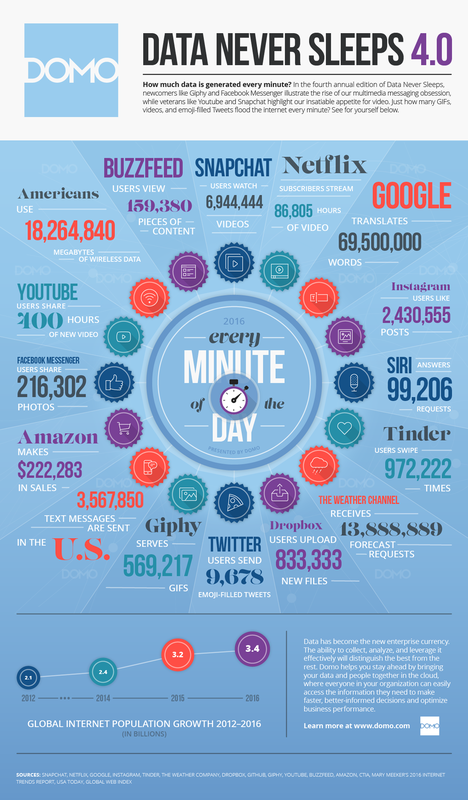 3,607,080 Google searches are conducted worldwide each minute of everyday. Worldwide, 15,220,700 texts are sent every minute! Instagram users post 46,740 pictures every minute. 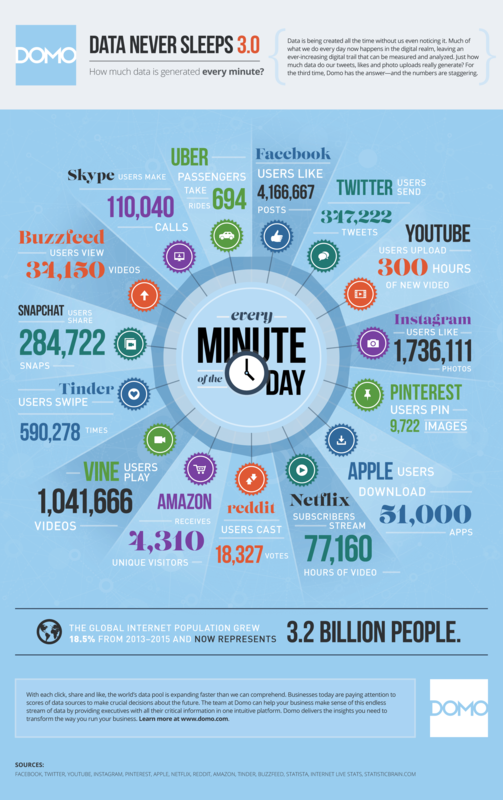 1,209,600 new data producing social media users each day. 656 million tweets per day! There are over 2 billion monthly active facebook users, compared to 1.44 billion at the start of 2015 and 1.65 at the start of 2016. 22 billion texts sent every day. 5.2 BILLION daily Google Searches in 2017. Don’t think with these increases in social media, that email is going away anytime soon! Email use continues to grow. The Email Statistics Report 2017-2021 by the Radicati Group confirms this – 269 billion emails are sent daily in 2017, and this is expected to grow by 4.4% yearly to 319.6 billion in 2021. The amount of mobile data is also blowing up – at the start of 2014, mobile phones/tablets uploaded and downloaded around 2 exabytes (1 exabyte = 1 billion gigabytes) of data. At the start of 2017, data created on mobile devices quadrupled to over 8 exabytes. Approximately 21.9 billion text messages are sent each day in 2017, compared to 18.7 billion in 2016 – a 17% increase in just one year. Devices are a huge source of the 2.5 quintillion bytes of data we create every day – not just mobile devices, but Smart TV’s, cars, airplanes, you name it – the internet of things is producing an increasing amount of data. IDC forecasts a 31 percent growth in wearable devices from 2016 – 2020. There were 28.3 million wearable devices sold in 2016, which would mean 82.5 million in 2020.
Business insider predicts that by 2020 75 percent of cars will come with built-in IoT connectivity. The growth in data and the way it can be used is also changing the way business is being done and the services that organizations can offer due to an enhanced ability to produce, capture, and understand data. Hidden in all this data are business insights that can trigger explosive growth. The problem is that finding them is like finding a needle in a haystack. That’s why early adopters are focusing on big data analytics and archiving. Research from IDC shows that 90% of the data produced is unstructured, meaning that it is typically text heavy and does not follow a predefined data model. That’s where big data analytics and archiving come into play – they give context to massive amounts of unstructured data, which helps find the needle of insight in the haystack of information. Unified archiving, on the other hand, makes the data manageable. Retain Unified Archiving by Micro Focus archives email, mobile, and social communications and stores them in a secure and easily searchable archive. This makes the data available upon litigation or compliance requests. The future innovators and market leaders across all industries will be the ones who can take this data and make the most out of it. Whether that’s gaining insights for a marketing campaign or a new R&D project, the internet and big data have the answers, and one thing is certain – tools are going to be critical in deciphering all of that information.